SM Cinema, currently the largest cinema exhibitor in the country, has been part of the lives of Filipino families for over 20 years. With its commitment toward quality movie entertainment, SM Cinema recently converted all its film-based theatres into Digital Theatres - the first cinema franchise in the country to do so. 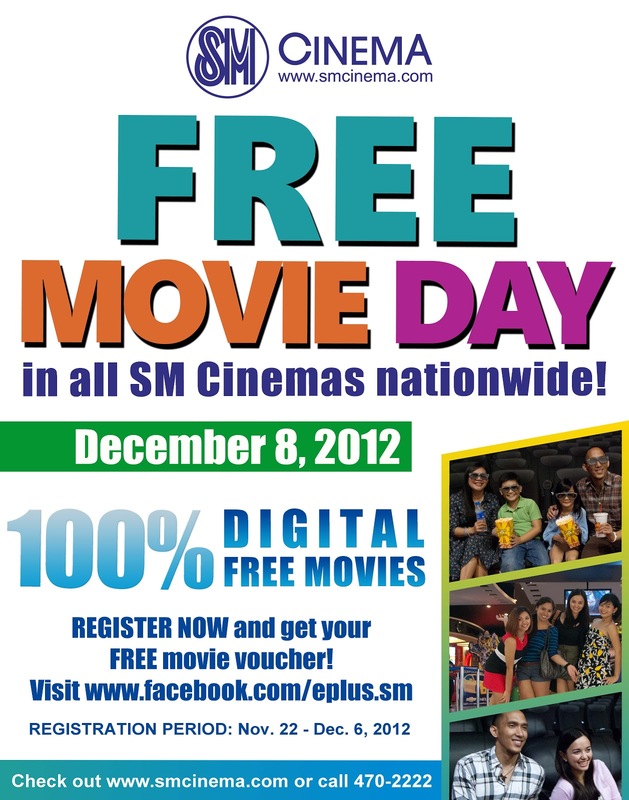 With this notable milestone, SM Cinema gives back to its loyal patrons with another FIRST in Philippine cinema history - the FREE MOVIE DAY event, a grand movie blow-out slated to happen this December 8, 2012. 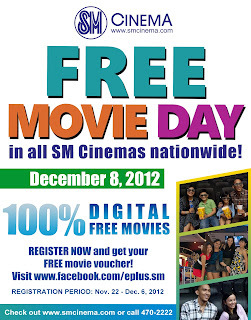 Free Movie Day is made possible by SM Cinema, e-PLUS card - your most convenient access to the movies, Multivision Pictures of the Philippines, AV Production, Crystalsky, Pioneer Films, Star Cinema and the Film Development Council of the Philippines. Free Movie Day is also being brought to you by Coca Cola, Bright Pop, Purefoods San Miguel and Mister Donut. SM Cinema is the country’s leading exhibitor - boasting 246 cinemas and 5 IMAX Theatres in 45 branches nationwide. SM Cinema continues to expand and lead the country’s development in cinema technology. For a more convenient way of watching a movie, experience the newest from SM Cinema - the CINEMOBILE: Your mobile, your movie ticket. With its turnstile system, SM Cinema delivers a more convenient movie-going experience to its patrons. You may also avail SM Cinema’s e-PLUS (Entertainment, Privileges, Lifestyle, Upgrades and Surprises) card to make your movie-watching more convenient, rewarding and fun. On top of the reward point scheme, e-PLUS is loaded with VIP privileges, special promos like a 50 percent discount on select movies, seasonal offers, quarterly raffles and invites to exclusive events. e-PLUS members can also avail promos and discounts from partner merchants. The e-Plus starter kit comes with your personalized e-Plus card, free movies, snacks and a premium item. To know more about the company, visit SM Cinema’s website at www.smcinema.com. You may also like SM Cinema on Facebook (facebook.com/smcinema) and follow them on Twitter (twitter.com/sm_cinema). To connect with IMAX on Facebook, follow facebook.com/imaxsmcinema and like them on Twitter.com/imax_smcinema.